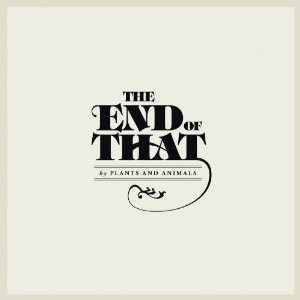 Since the release of La La Land, the band’s second album in 2010, Plants and Animals have obviously lived, loved, and lost a little along the way, and The End of That amalgamates all the tales and lessons learned into a collection of songs that shows how confident they are as a band. When I say “confident,” I mean that in a very positive, they-know-what-they’re-doing-and-how-to-do-it kind of way. The band took a step back and found a way to blend the distinctively different styles of their two previous albums into a more intimate album that will definitely attract new fans as well as keep the hard cores happy. From the laid back melody of the opening track “Before” to the more progressive and rocked out “2010,” this newest album by Plants and Animals seems to have it all and then some. For more details about Plants and Animals as well as upcoming tour dates, visit the band’s official website here.